In 1938, the British Empire conquered Heaven and twenty years later, death is not final anymore. British citizens deemed worthy are offered a Ticket, a pass to an afterlife in Summerland, a metropolis made of souls. However, afterlife has a cost and death is now an asset in the pre-war years. In this alternate history, World War II never happened and the Soviets are building their own Summerland. Their aim is to create God by making a machine compiling the souls of all the loyal and obedient Soviet citizens. Their God will be all knowing and will allow them to conquer Earth and all its heavens. Rachel White is a SIS agent working for the Crown: she is slowly earning her Ticket that will allow her to join the rest of her family in Summerland. During one of her missions, she gets a lead on a mole residing in the Summer Court. However, being a woman in the SIS isn’t easy and Rachel doesn’t have the support of her higher-ups. It doesn’t help that the alleged traitor has a lot of high placed friends such as the Prime Minister but most of all, that he’s dead. How do incriminate a soul? Her only way to do so is to go rogue and find allies who are able to infiltrate the world of the dead. 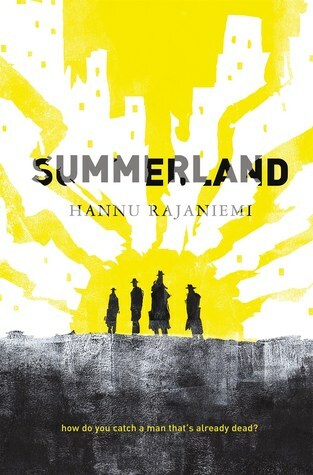 Summerland is a very unique kind of spy fiction novel. In this world, since death is not final, the dead have a very big part to play in the political situation and people’s feelings toward death is very different from what we know. Indeed, for most of them, life is only the beginning. Murder and death are overrated since you can just continue doing everything you used to do “before” in Summerland. What’s really the point of living in this situation except to earn your Ticket? However, since the system is based on merit, inequalities of daily life transcend death. Only the ones deemed worthy or rich enough can buy their way into the afterlife and, even with all the money or merit, the souls of the dead start disappearing after a while anyway. If you are poor, death is the end, if you’re rich, you can only put it off for so long. This novel has a fascinating worldbuilding and its execution is done perfectly. At first, I was quite lost because Rajaniemi throws you into this world without a lot of explanations and you have to figure everything out on your own. Learning the vocabulary and finding out what is alternative history to what really happened to place the story in the right context is the most difficult part. However, even is it is a bit much at first, when you get how this world work is the moment you can truly appreciate Rajaniemi’s genius. The novel is really short for the sheer amount of imagination and worldbuilding it contains. At the end of the book, I felt like I almost knew this alternate world as well as my own! It also helps that the plot is very engaging and that I really enjoyed reading from both perspective: the mole and the one trying to find him. I was rooting for both protagonists and they felt like real people. I related a lot to Rachel’s struggles as she is trying to do her work as well as she can while being refrained by her male entourage who just want her to quit because, after all, women shouldn’t ever be spies right? I could also sympathize with Bloom and why he was working against his own country. I don’t read a lot of spy novels but I enjoy them quite a lot, especially when they have speculative elements (like Dave Hutchinson’s Fractured Europe Sequence for example) and this one was the perfect example of that. The story was intriguing, the world fascinating and even if this novel is standalone, I want more stories set in this world! I received a copy of this book in exchange for an honest review. All opinions are my own. My thanks to Tor Books and Netgalley. 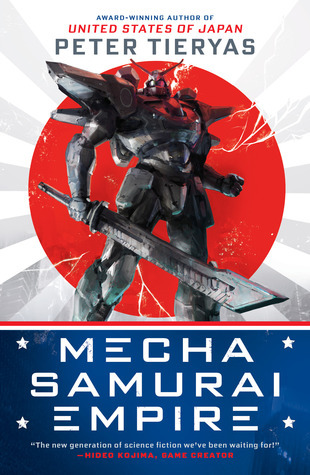 A standalone book set in the USJ universe, Mecha Samurai Empire focuses on a group of aspiring mecha cadets preparing to fight the Nazis. Foremost among them, Makoto Fujimoto grew up in California, but with a difference–his California is part of the United States of Japan. After Germany and Japan won WWII, the United States fell under their control. Growing up in this world, Mac plays portical games, haphazardly studies for the Imperial Exam, and dreams of becoming a mecha pilot. Only problem: Mac’s grades are terrible. His only hope is to pass the military exam and get into the prestigious mecha pilot training program at Berkeley Military Academy. Mecha Samurai Empire is set in the same universe as United States of Japan, Tieryas’s previous novel, in an alternate history where the Axis won World War II: the United States of America are now the United States of Japan and a part of the Japanese Empire. Mecha Samurai Empire follows Makoto Fujimoto, or Mac, a young student whose only dream is to become a mecha pilot. In order to train himself for the simulation test portion of the Imperial exam, Mac plays a lot of video games with his friend every time he gets the chance. He is quite good at it, however, to enter the university of his dreams, he also need to excel in the theorical part of the exam. Being a pretty average student, he knows he’s probably not going to be able to reach his dreams,at least, not without a miracle. A few days before the exam, his best friend Hideki informs him that he has find a way for them both to obtain good scores: he has heard of a way to cheat that will be undetectable by the Empire. Mac knows it is probably is only chance but after thinking about it for a while, he decides that he doesn’t want to cheat even if it might be his only chance. Come the day of the test and Hideki’s plan goes terribly wrong as the technology given to him to cheat is actually a hacking device made by the NARA, an organization of American rebels fighting for the freedom of the United States of America. Because of his link with Hideki who is now seen as a traitor by everyone, Mac not only fails the Imperial exam but he is now also on the radar of the Tokko, the Imperial secret service. His only chance to ever become a mecha pilot is to join the civilian pilot ranks and wait for an opportunity to arise. However, during his first mission, Mac finds himself in the middle of a fight that might spark a war between the United States of Japan and the German Empire that will change everything he ever thought about the war. I read and I really enjoyed United States of Japan when it came out a few years ago so I was excited to read another story set in this world. Both works are standalone so you don’t need to read one to understand the other however, if you are intrigued by both novels, I would still recommend that you read USJ first. Indeed USJ as a lot more worldbuilding than MSE and it will give you a bit more context and explanations about this alternate history world and how it came to be. Mecha Samurai Empire is a bit more contained and focused that USJ, it is narrated from Mac perspective and we only follow his journey as he grows from a very naive student to a cadet confident in his abilities. I have to say though that, out of the entire cast, Mac actually is my least favorite character, I found him a bit too passive and ignorant for my liking. The other members of his crew were a lot more interesting especially Kujira, Chieko and Nori. Kujira especially was a fascinating character and I would have love to follow his story and learn more about his past. However, except for the main character, I quite enjoyed Mecha Samurai Empire, if you are looking for your daily dose of mecha action, this book has you covered! I’m sure it would make a great anime or action movie. Even if I liked it a bit less that United States of Japan that I found particularly original and different, I would still recommend Mecha Samurai for those who are looking for an action-filled book with giant killer robots. And who wouldn’t? I received a copy of this book from Wunderkind PR in exchange for an honest review. All opinions are my own. 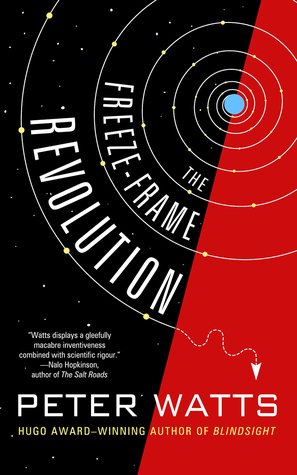 The Freeze-Frame Revolution is set in Watts’s Sunflower cycle which is a series composed of several shorter works. I haven’t read any of them before reading this novella and I’m pretty sure you don’t have to either to understand it. It probably gives a bit more insight into this world but Freeze-Frame works perfectly fine as a standalone story. The Freeze-Frame Revolution is quite different from The Rifters trilogy but it’s a masterpiece in its own right. It’s complex, detailed, impactful and much more stronger than a lot of novels. I would recommend it to any science fiction lover, even those you don’t usually like novellas because it’s so accomplished that it doesn’t feel like one at all (not to say novellas are bad by any means, they just feel a bit too short sometimes). I definitely want more stories set in this world so I will check out some of the other stories set in this universe for sure! I received a copy of this book from the publisher through Netgalley. My thanks to Tachyon Publications. All opinions are my own.